Allegro By Matouk Monogrammed Luxury Bedding Collection is elegantly crafted rows of applique adding a touch of exquisite boldness that perfectly adorns the white percale, woven from the finest 600 thread count Egyptian cotton. Handsomely designed to coordinate with an array of bedding ensembles, this collection has all the classic elements, yet still melds perfectly with modern design. Monograms will be matched to trim color. We will use the tape for an applique to match the trim you choose for the monograms. If you choose an embroidery style we will match our threads to the trim. 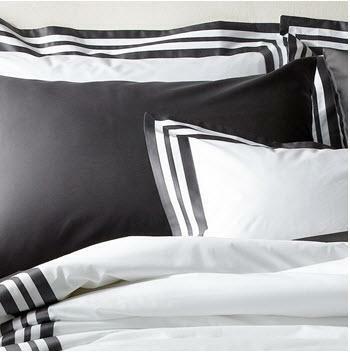 We love to see this bedding with the large 12' monogram on the center of the the duvet cover. Add either the large monograms on the shams or go small on the the top edges of the shams. Need help? Pick up the phone and give us a call 864-271-3587 We will be glad to help you create your perfect bedding. Made in the Philippines of Italian fabric. Fitted sheets are labeled "Milano"
Please Note: Step (3) Custom Options (color, monogram, etc.) will be automatically added to the appropriate items. Matouk Allegro Trim Colors: Monograms will be matched to trim color.